What do you think of this early photo of Jennifer Lawrence as Katniss? I’m reserving judgment on the film overall, but I have to admit she looks pretty good in character here. Love the braid and the coloring–and what a beautiful neck she has! 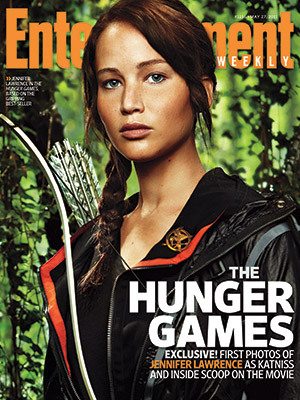 There will be more photos from the set in the May 20th issue of Entertainment Weekly. I can no see no one else as Katniss and I feel like she was cast perfectly! Can’t wait to see this movie. Hi, I found you on GRs YA Fiction for Adults, and I’m a new followr :). Jennifer Lawrence has completely won me over as Katniss. She looks fierce! I’m really looking forward to the movie. I really hope it does the book justice.